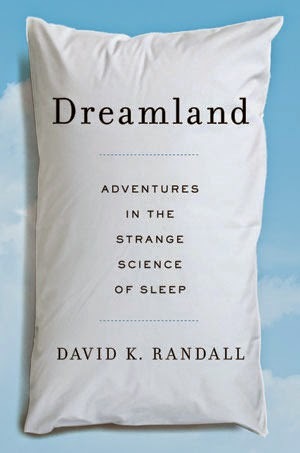 In Dreamland, Randall explores the research that is investigating those dark hours that make up nearly a third of our lives. Taking readers from military battlefields to children 's bedrooms, Dreamland shows that sleep isn't as simple as it seems. Why did the results of one sleep study change the bookmakers odds for certain Monday Night Football games? Do women sleep differently than men? And if you happen to kill someone while you are sleepwalking, does that count as murder? This book is a tour of the often odd, sometimes disturbing, and always fascinating things that go on in the peculiar world of sleep. You ll never look at your pillow the same way again. Standard pop science fare. The author does a fine job in researching sleep and the ways it is studied and I had no problems with his methodology or source citation. It's certainly something that the average reader will find accessible and doesn't get bogged down in medical or scientific terminology. Maybe I'm just super spoiled by authors like Mary Roach, but I didn't get any feel for the author's personality. It was, to be honest, a bit dull at times. It was accessible and understandable, but not necessarily entertaining. This is going on my overwhelmingly average shelf. Nothing bad to report, no complaints, but nothing exceptionally good to report either. I expect to have forgotten most of it within the next few months, honestly. If you're super interested in sleep, maybe it's a good one to try, but it wasn't a home run for me by any means.